Still at the ‘unproven theory’ stage is the potential function of the supplementary air intake above the drivers head. This had been presumed to be purely to feed an oil cooler, but closer inspection suggests there may be another primary function for this inlet. Allied with the shark fin, the inlet appears to provide airflow to inside the rear wing. Creating a ‘blown slot’ to make the rear wing more effective. Similar to a concept used by BMW Sauber last year. It looks like McLaren have opened up a slot in the back of the rear wing, this is visible as a blackline above the normal slot between the wing and flap. This slot is fed with air from the inlet and routed inside the shark fin and rear wing flap. The high pressure air exits through the slot and effectively makes the two element rear wing into a three element device. This allows the rear wing to angled more steeply without fear of stalling, thus creating more downforce. Clues to support this theory is the way McLaren have closed off the inlet, an access hatch inside the shark fin, as well as the bulbous shape of the fin leading towards the rear wing. As BMW Sauber set a precedent last year with a flap blown by an inlet in the front of the wing, this is a legal approach to circumventing the restriction on the number of elements allowed in the rear wing. This entry was posted in Jerez Feb 2010 test, McLaren MP4-25 by scarbsf1. Bookmark the permalink. Scarbs, there is a possibility that it might be sucking rather than blowing. A lot of the flow viz on the wing didn’t look like it supported the blowing theory but might show sucking. Ok, but why connect it to the engine air intake? Does this not risk stalling the airflow into the airbox if the flowrate is too low out of the slot? By passing faster air at the bottom you are creating lift but aimed at the road. Though there is a trade off with drag and the amount of the weight loading on the rears. This might not be a good idea since they need to conserve tires and fuel. Trying to reverse engineer someone else’s idea can be a difficult and thankless task. Could the unit be [disguised] to bleed air away from the air intake at higher speed? Effectively creating a variable air-intake, which in itself is not legal. To feed this slot from near the airbox would result in a very long and narrow duct. So much energy would be lost due to the boundary layer in the duct that I think the net effect would be negligable if it works at all. Firstly there is no evidence that there is direct feed from the airbox inlet to the wing, and a few clues that ar is being fed into a chamber where the pressure is increased. This coupled to a the LOW pressure behind the wing will draw air out via the slot and in effect blow the wing element, maintaining boundary layer flow. another way of achieving lap blowng is by bleeding exhaust gas off an Exhaust gas recirculation system (EGR). Running EGR has a fuel economy benefit as well as provides an opportunity to provide positive pressure throught the wing slot. There are few other alternatives that won;t be classified as a movable aerodynamic device since EGR’s primary benefit is lower emissions and improved fuel economy. I did point out that this is at ‘unproven stage’, as there’s a lack of good photography. but I stand by the suggestion the feedcomes through the sharkfin and secondary airbox inlet. I’m aware of EGR but I doubt this is used here, the heat of the exhaust gas woudln’t be practical with carbon compisite wings. EGR for wing de-icing was dropped from the all-carbon 787 becaus eof this. instead they had to use electrical heater blankets moulded into the slats! maybe the airflow into the lower inlet depends of drivers head position ?? So there is a high pressure air coming out of the slot, or fast flow? I assume the duct accelerates the flow but not to such a low pressure as the suction surface of the wing? Does the Sauber still have this feature? If you get a chance at the Barcelona test I’d ask one of the McLaren guys about how they are using the driver’s leg to switch on and off a system to stall the top rear wing. 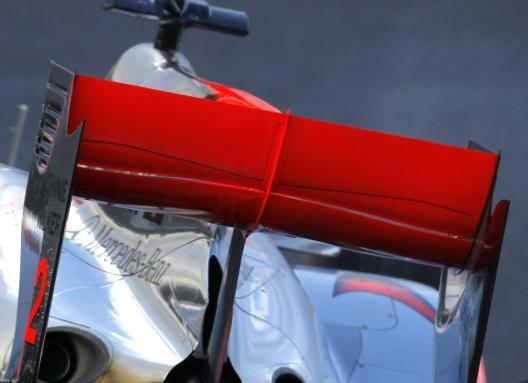 The slot in their rear wing flap is not too keep the flow attached for longer – it is in fact the opposite – the system, through angling of an additional mass flow vector in, stalls the top rear wing. Rumour is that the system is overruled by a “switch” in the cockpit (operated by the drivers leg) such that they can effectively stall the rear wing down any long straight. I’d love to ask that question, but its highly unlikely that any one would give me a reply! Of course you aren’t going to get a straight answer, but it would be good to let them know that their trick rear wing is not so secret anymore!